Rates: depends on amount of meals p/day. Typical host family: we have many different types of families to choose from, most of them located near our Spanish schools. Find out about what they're like. What's provided with each home stay? : a private room, adequate study area, weekly change of bed linen and towel, house key, clean shower and bathroom, and selected daily meals. If required, laundry services can be provided at an additional fee. Selecting your host family: fill out an interview to help us choose the best family for you. 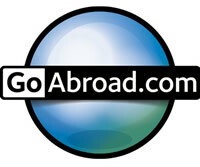 Start Dates: home stays usually start on the Saturday or Sunday before your Spanish course begins. The rates below are PER WEEK of accommodation with a local family. Prices are shown in US Dollars. We normally place only one student with each local family (unless it's a couple or family traveling together). We do this to "force" you to speak Spanish. The "number of students column" refers to arrangements for couples and families or friends traveling together who wish to be placed within the same local family. Please note: prices are in US Dollars. Children receive a special discount when they stay at a home stay with their parents: children 7 years old and under have a 25% discount (children 8 and above pay the full rate). Each family home stay has a $75 USD setup fee that includes processing your Immersion Pre-Program Interview, selecting and reserving your host family, airport or bus station pickup at home stay location and transfer to home stay. 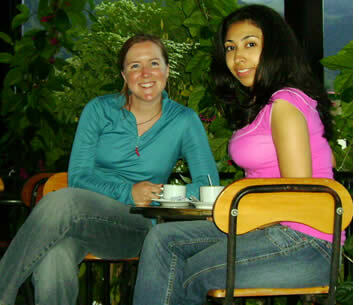 Home stays in Boquete and Bocas del Toro do not include transfer from Panama City nor pickup in Panama City, but pickup in Panama City can be arranged for $45 extra, and transfer by bus or plane from Panama City can be arranged by us at your cost as well. 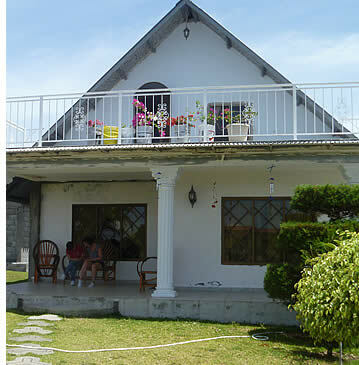 Home stays in Boquete include pickup in David and transfer to Boquete. If students arrive out of office hours (before 8 a.m. or after 5:30 p.m. then the pickup can be arranged for an additional $15). If you're doing home stays in various locations, your second and third home stay setup fee are only $50 each. Students who are also going to volunteer, only need to pay one setup fee (the volunteering setup fee is also $75). Laundry facilities can also be used for a $5 fee per load of clothes. It is somehow difficult to describe a typical host family as there is such a variety. Some are young couples without children, others have babies or teenagers. We also have single parents and couples whose grown-up children no longer live at home but come to visit once in a while and we even have families that have a set of grandparents living with them, which offers a great opportunity to learn even more about Panama's history. Our host families are middle class by local standards. A typical house will have a living room/dining room, a kitchen and bathroom and 3 or 4 bedrooms. There is often a yard outside which people use as an extension of the house. As there are so many different types of host families we ask our students to fill out an Immersion Pre-Program Interview that will help us select the best family for them. We will do our best to choose the family that you're looking for. Most families are located within walking distance to our Spanish Schools (5 - 15 minute walk) and only a few of our host families homes are located in the outer parts of the town of Boquete and Bocas del Toro, or further away from our school in Panama City, and require public transportation to get to them (never more than 15 minutes). The families that are a little bit further away have more upscale homes and can host couples or entire families. Several of those families can even give you a ride at certain times of the day. Each Spanish language immersion student will be given a private room and study area. Each bedroom is clean, well ventilated and illuminated. Upon request we can arrange a shared room suitable for couples with a private bathroom. Houses that can offer these facilities are usually outside of town within a 10 minute ride by public transportation. Clean bed linen and towels are given on a weekly basis. Each house provides students with access to daily bath or shower and such is the hygienic custom in our culture. In Boquete and Panama City you might have your own private bathroom, but in Bocas del Toro you'll most likely share a bathroom with other family members. Each family has basic laundry facilities with detergent included and an iron. Students can use the family's laundry facilities if required at an additional fee of $5 USD per load. There are some families that volunteer to wash their "sons/daughters" clothes. Like in any family: just talk and you'll find out what's the norm in your new house! In regards to amenities, most houses in Panama City will have internet, as well as some in Boquete. Home Stays in Bocas del Toro won't have an internet connection. Thanks to Boquete's altitude, air conditioning is not necessary. The standard of living in Bocas del Toro is slightly lower than in Boquete so expect houses to be humbler (and with no air conditioning). In Panama City there will be a supplement of $50 USD per week if you want a room with air conditioning. Regarding meals, you can choose to have 1, 2 or 3 meals per day and we will select a family accordingly to your needs. Please read the sidebar of this page to know more about what type of food to expect in your homestay. Feel free to specify these and/or any other requests through our Immersion Pre-Program Interview and we'll choose a family just for you! Spanish language students will be provided with a key to the house and will be allowed to come and go as they please (except for underage students). Our families really know how to look after our students and make them feel at home. Our immersion students are asked to be respectful with the family's customs and although the family will make them feel as comfortably as any other member of the family, we ask our students to remember that they are guests and to always think about how they would like a visitor to behave if they were the hosts. For example, there is no harm in arriving late on weekends, but families always appreciate if you let them know where you plan to be and at what time you plan to arrive because they'll have concern of your well being just as any good family would. Even if our families are not responsible for our immersion student's safety, they do feel as they are. It is a nice sign of gratitude and a polite gesture to make them feel at ease by letting them know your plans. In the case of our Spanish for Teens Exchange Program, host families do take responsibility for the well being of their new son or daughter and daily curfews do take place. Nowadays our Panama Spanish Schools have plenty of host families (our complete database has more than 120 host families). It all started out by knocking on strangers' doors when our Spanish school had just begun to receive its first students looking to live a Spanish Immersion Program. As time has passed by, the word has spread out and now families refer new families and we even have families come to our Spanish schools telling us that they would also love to have a Habla Ya student at their home. 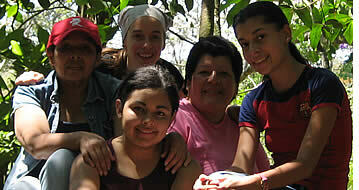 Although we have many local families participating in our homestays we are always looking for more families. Now and then we do find a new family, enthusiastic about the idea of taking part of this beautiful cultural exchange program. In order to be able to choose the best host family for you, just fill out our Total Spanish Immersion Pre-Program Interview. After choosing your host family we will get back to you with a complete description about them. We always visit and interview each family before accepting them and monitor the quality of their hospitality through routine visits, phone calls and students' feedback. When can I start my homestay? Details here...Click to collapse. Students should try (the emphasis is on the word try... it's not mandatory) to start their home stay on the Saturday or Sunday before their Spanish course begins. BUT IF THEY CAN'T, NO WORRIES... WE ARE VERY FLEXIBLE! Once Habla Ya has the student's arrival details, a pickup is arranged. In Panama City we will pick you up at Tocumen Airport, Albrook Airport or at the Bus Station. For Boquete we can pick students up at the airport or at the bus station in David. In Bocas del Toro we can pick students up at the dock or at the airport. After the student is picked up, a short visit to the school takes place (as long it is open) and afterwards, they'll be taken to their host family. If students plan to arrive between the Monday and Friday before their course begins we ask them to please let us know in order to make sure that their intended host family is available beforehand (another student might still be at it). And if students intend to arrive on the Saturday or Sunday before their course begins, we also need to know their arrival details so that we can arrange their pickup. If students were to arrive to Panama City, David or Bocas del Toro out of office hours (before 8 a.m. or after 5:30 p.m.), a pickup can also be arranged for an additional $15 on top of the home stay setup fee. If on their first day in Panama City, Boquete or Bocas del Toro, you arrive too late (after 8 p.m.), you might have to spend that night in a hotel or hostel of your choice (again, we can help!). With certain host families it could not be considered polite to start an Immersion Program so late a night. Once they know, students should inform us about their travel arrangements and estimated time of arrival to Panama City, David or Bocas del Toro as this will avoid the family having to wait at home unnecessarily. Families also like to receive their new family member with a special meal so they highly appreciate knowing when you intend to arrive. Please remember to specify all these details in our Pre-Program Interview but if you still don't have your exact travel details, don't worry: we will ask you and remind you to give them to us because we need to know them =), but it's better if you fill out the interview as long as you already know the weeks in which your Spanish Immersion Program will start and end because in that way we will be able to reserve the most adequate host family for you. Home stays usually begin on Saturdays or Sundays in the afternoon. If you plan to arrive before Saturday or if you would like to stay for more days after your course has ended, please let us know about your intentions so that we can plan ahead of time taking into account host family availability or any other arrangements needed to be made. Hoping to get the ideal host family? Each one is carefully handpicked! Contact us! 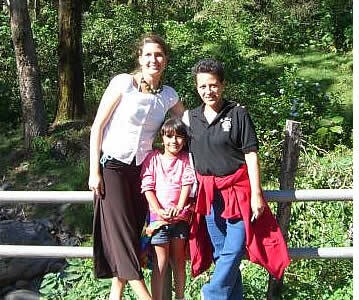 The idea behind our Total Immersion Program is simple: live a local family while you study Spanish at our Schools. This will put you in a unique and privileged position to learn more about our culture and to practice Spanish in a natural, relaxed and authentic environment. If you want to get a real feel of Latin American life, experience our customs and learn Spanish effectively, this program is for you. Read more about our Latin Cultural & Spanish Immersion. How Many Meals & What Type of Food Will I Have? When you live with a local family during your Spanish studies you can choose from 1, 2 or 3 meals per day. You can choose between having only breakfast, half board (breakfast and dinner) or full board (three meals each day). Each meal will be served at the family's daily eating time. Family's schedules are different from one to another but usual eating hours in Central America are from 6 a.m. to 8 a.m. for breakfast, from 12:00 p.m. to 2:00 p.m. for lunch, and from 6 p.m. to 8 p.m. for dinner. If for any reason you would prefer to eat at a different time then when your family usually eats then your meal will be stored so that you can heat it up at a different time or if you prefer to eat before you'll also be allowed to prepare it by yourself. But these should be considered as extraordinary occasions. Students are encouraged to take advantage of their situation and interact as much as possible with their host family. Like with any family, these issues can be discussed. Typical Panamanian dishes usually include rice and beans prepared in many different ways. Pasta is also quite normal. Different varieties of salads are commonly served as a side dish and a portion of meat is mostly present at lunch and dinner. Chicken and beef are more common than fish and pork, although families will always ask about your food preference. Breakfast can include fruit, eggs, bread, cereal or fried Panamanian typical food. 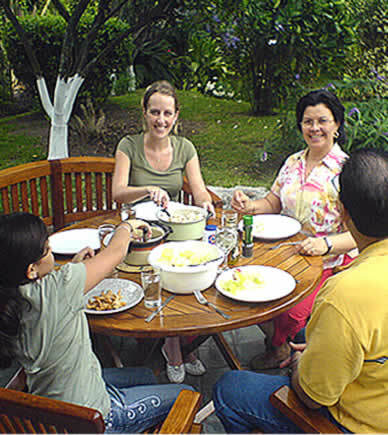 Certain host families are able to cater to special eating habits or diets. Allergies and other medical situations are always taken into account. In our experience we have seen it is very convenient for vegetarians and vegans to personally talk with their family and help them prepare the healthy meals that they would like to have. The concept of not eating meat and other types of food from live animals is still new within some areas of our culture and you might even feel more comfortable preparing your own meal (just because it will be easier for everybody). Having said that, we do have families that are vegetarians themselves. Being able to eat what you want while you live a local family is very important. This is yet another reason for filling out our Pre-Program Family Interview in detail.